What verb do we prefer with ‘any of’, ‘each of’, ‘either of’, ‘neither of’ etc? What verb do we use with ‘a lot of’, ‘plenty of’, ‘all of’ etc? What verb do we use with ‘each’ and ‘every’? What verb do we use if the sentence begins with ‘every-/no-/any-/some-’? What verb do we use if the subjects are joined by ‘either..or’ or ‘neither..nor’? What verb do we use in a statement with %? We prefer a singular verb with any of, each of, either of, neither of, none of followed by a plural noun. We use a plural verb with a number of, a lot of, plenty of, all (of) or a majority of followed by a plural noun. But when followed by an uncountable noun, we use a singular verb. 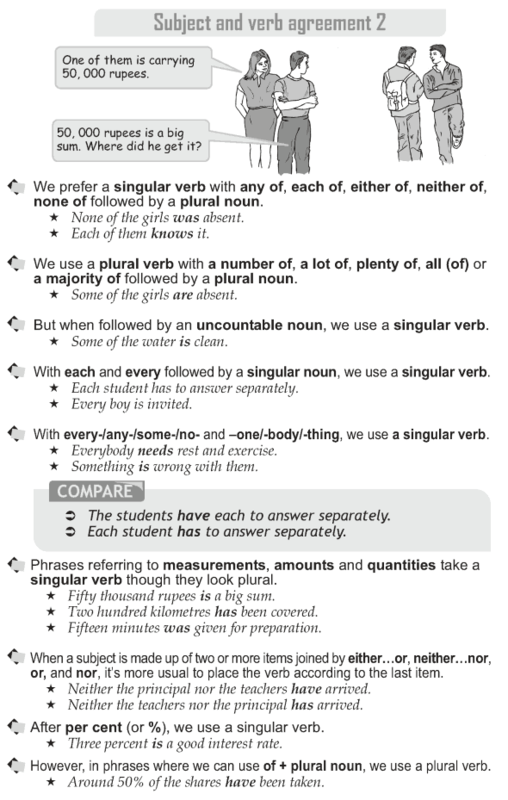 With each and every followed by a singular noun, we use a singular verb. With every-/any-/some-/no- and -one/-body/-thing, we use a singular verb. Phrases referring to measurements, amounts and quantities take a singular verb though they look plural. When a subject is made up of two or more items joined by either.or, neither.nor, or, and nor, it’s more usual to place the verb according to the last item. After per cent (or %), we use a singular verb. However, in phrases where we can use of + plural noun, we use a plural verb.